I recently went to a wedding at a small vineyard in Virginia. The couple had an absolutely gorgeous day with perfect temperatures and not a drop of rain. Their ceremony was performed under a simple gazebo overlooking the vines. 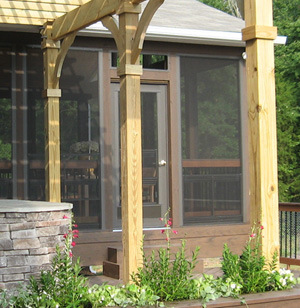 Gazebos are a classically beautiful outdoor living structure with their many sides. In many places, they are freestanding rooms, but recently we’ve been noticing more gazebos being added to patios or decks. They make a good addition to provide some needed escape from the sun. Because gazebos have a lot of side and a sturdy roof structure, they really do feel like rooms outside the home. In the backyards I’ve visited that have had gazebos, they always feel like the natural space to sit down and enjoy company. I’ve seen them with both dining tables and benches and chairs beneath them. Because the living space of a gazebo has protection with the roof structure, they truly can be used all year round. Adding a fire feature would allow you to enjoy the changing leaves in the fall and winter while a fan will make the warmer summer months more comfortable. When I think about gazebos, my mind normally goes to the classic white gazebo frame with a dark grey roof, but there are many more design options. 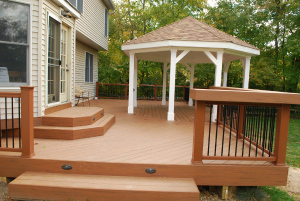 With the growing popularity of low maintenance decking, more homeowners prefer low maintenance gazebos as well. From reds and browns to greys and blues, the color options are endless. Additionally, post details are popular and ceiling designs vary. 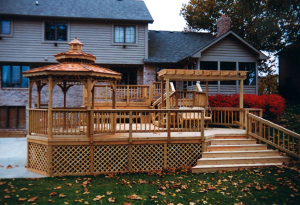 At Archadeck Outdoor Living, each gazebo, deck, porch, patio, pergola or other outdoor living structure is custom designed for each individual client. With our design renderings, you’ll see exactly what your yard will look like with our proposed enhancements. 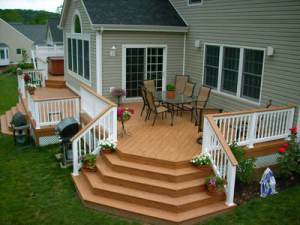 If you are interested in updating your outdoor living space, please reach out to the nearest Archadeck office. When looking at our franchise locations’ outdoor living spaces, I always notice the unique ways that deck, porches, patios, sunrooms and other structures add functional space to a home. Space that doesn’t serve a purpose is just lost space, right? This project from our sunroom and deck builder in Connecticut is a great example of adding space in a different and interesting way. The owners of this Devonwood, Connecticut home wanted an addition to their home as well as more outdoor space. Making all of it feel natural to the home was very important as they didn’t want anything disjointed. Phil Brown and his Archadeck of Central Connecticut team designed and built a custom sunroom and deck that fulfills all their needs. The common sunroom is square or rectangular in shape and has windows on three of its sides. 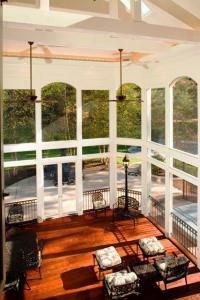 Sunrooms allow people to sit and enjoy the nature that surrounds the home without actually being inside. The common sunroom, however, was not what these homeowners wanted. 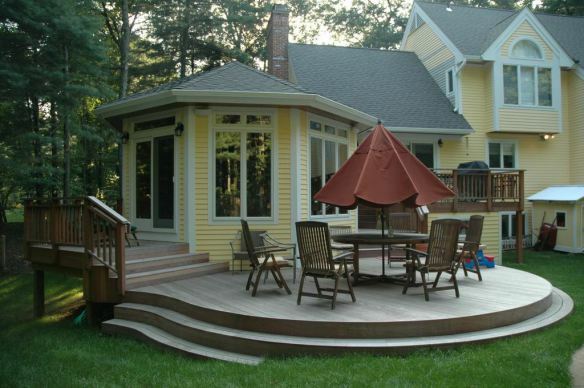 Instead, Archadeck of Central Connecticut designed an octagonal sunroom. Being set on the back of the house, the room is very cozy, but still spacious with enough room for a couch and chairs. 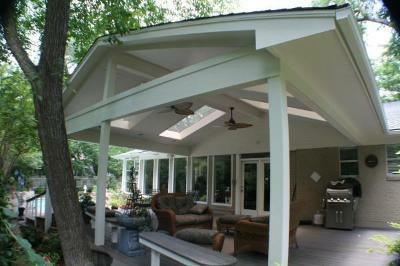 Instead of a flat roof, a gazebo style roof was added to the sunroom. 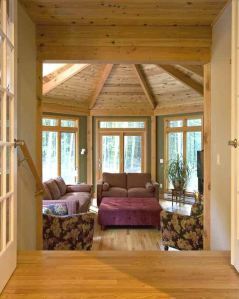 The pine ceiling adds to the warm and cozy atmosphere and the large Anderson windows allow the sunlight to flood in. I love how the windows don’t have panes that can obstruct the wooded views of the property. It gives it a very airy impression. Outside, Phil designed a deck that fit all of the homeowners’ needs. The majority of deck space is taken up by the large curved deck below. It serves as a place to sit and eat dinner on a nice New England night. Off the sunroom is a smaller deck that is used to sit and relax and right off the back of the house is a rectangular deck that is the perfect go-between from the house to dining portion. A grill sits on that deck since it is so convenient to the kitchen. The entire deck was finished with IPE decking. IPE is a very dense Brazilian wood that is rot and insect resistant. It is very durable and will easily stand up against increased traffic and usage. The warm tone of this IPE wood looks gorgeous against the yellow of the home and the wooded areas surrounding the property. The best deck designs take the homeowners and their passions into account. In this example, one of the homeowners is an avid gardener, so when Phil designed this deck, he wanted a place for her to keep her tools and pots. The grill deck, as a result, also serves as a roof structure for a potting shed below, keeping that covered space as usable. Genius! If you are looking to enhance your property with the addition of a custom outdoor living space, please contact your local Archadeck Outdoor Living office. One such element that we often install in our outdoor structures is the skylight. Gone are the days of the skylight just simply being a skylight. Sure, they allow for your structure to receive more sunlight, which really opens up your space and gives the space a feeling of airiness. But today’s skylights offer many other features as well. 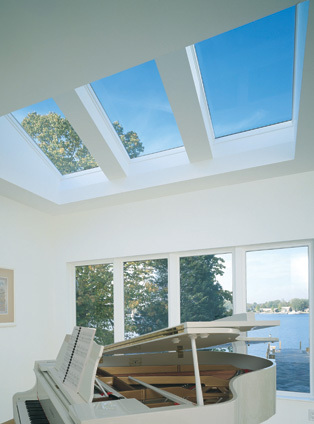 Velux skylights are the skylight of choice for many of our! Archadeck locations throughout the country, and for good reason. They offer high quality skylights with a myriad of available features with your convenience in mind. 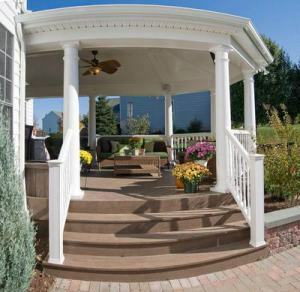 From Victorian to gothic, country to modern; the gazebo possibilities are endless. I know for many people January is a time when we begin to think about spring. All the holiday hustle and bustle is over, and even though winter is hardly over, we start to think of the ice melting, lighter sweaters and planning outdoor projects for the upcoming season. But, even though it might not feel that way, Spring is just around the corner. This is the perfect time to plan your outdoor project. Whether you are planning which colors to put in your annual spring garden, or the addition of an outdoor structure to compliment your home and garden, now is the time to start. 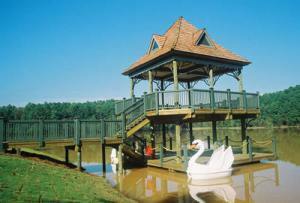 When thinking of outdoor structures a beautiful and classic structure comes to mind, the gazebo. A gazebo is a pavilion structure, sometimes octagonal. They can be either freestanding or attached to another structure such as a deck or a wall. They are roofed yet open on all sides. The origins of the gazebo go back over several millennium. Gazebos have been in the literature of China, Persia and many other classic civilizations. George Washington had a small eight-sided gazebo at Mount Vernon. Thomas Jefferson wrote about gazebos and called them summerhouses or pavilions. Today this classic structure is as popular as ever. 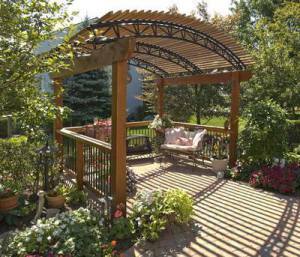 Gazebos not only provide shelter and a place to rest, they are a wonderful ornamental addition to your landscape. 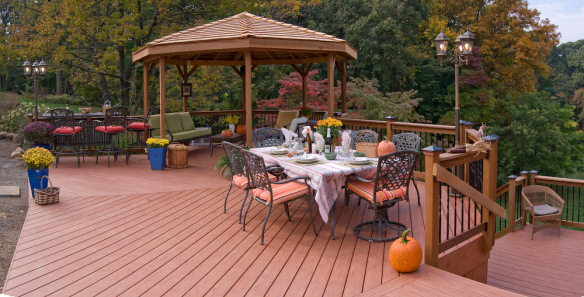 Archadeck prides itself on the diversity and aesthetic appeal of their gazebos. With a vast assortment of elements and materials to choose from, Archadeck can build anything your imagination can dream up. Gazebos can turn your garden into an enticing treat and provides the opportunity to create an outdoor room. There are endless options to choose from when planning a gazebo. From location, to material, to shape and size. 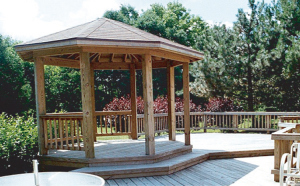 Gazebos can be screened to create an insect free spot that you can enjoy year round, regardless of the weather. Gazebos can be finished out with built in benches, this eliminates the need to worry about seating. There is also a large selection of outdoor ceiling fans and outdoor lights that can be added to give a personal touch and create tranquility in your gazebo. You can raise a gazebo a few steps to take advantage of garden vistas, this also solves the problem of a tricky slope. 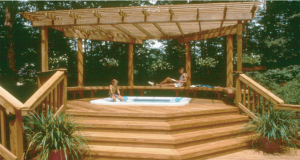 Gazebos are an excellent choice to cover existing hot tubs too. They can be large or small, from octagon, square and even round. Design preferences range from using your homes design and carrying the style into your landscape, or can be totally different. From Victorian to Gothic, country to modern and sleek- the possibilities and individuality are endless. 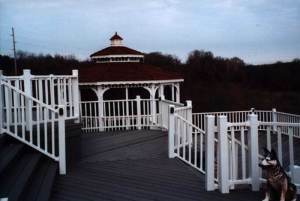 If you are considering adding an outdoor structure like a gazebo to your landscape, just give Archadeck a call. Their talented and experienced staff can guide you every step of the way. You will be ready to have tea for two (or twenty ) on your new Archadeck gazebo by the arrival of Spring. 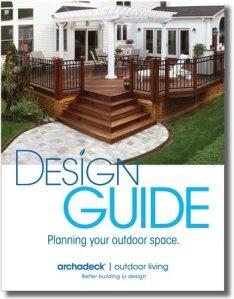 This full-color design guide features outdoor living space photos, ideas, tips and hints to give you a starting point in planning your new outdoor space and make your backyard the best it can be. It takes you on a guided tour of where to begin in planning the backyard you have always dreamed of. The first step begins with functionality and helps you determine exactly what you want to do in your outdoor space. For example, within the patio and hardscape portion you will be asked to answer questions like do you want to dine, entertain, garden or just relax in your outdoor space. As you answer the questions it will lead you into ways to incorporate nature into your outdoor space because after all that is what makes these spaces so special. Do you want sunshine streaming in? Or maybe an outdoor space free of insects? The view from within your outdoor space is of utmost importance and Archadeck has made this another point of focus in our design guide as well. This guide also aids in deciding where to place your outdoor space by taking into consideration the direction your backyard faces all the way to your lot and soil conditions. A well planned outdoor space can complement not only your home’s exterior but the interior as well. With this in mind we show you how to plan a structure that allows for easy transition from interior spaces into your outdoor space. It’s the peak of summer now, and the sun hotter than ever. You can get a sunburn all year long, but did you know you don’t have to burn at all to develop skin cancer? 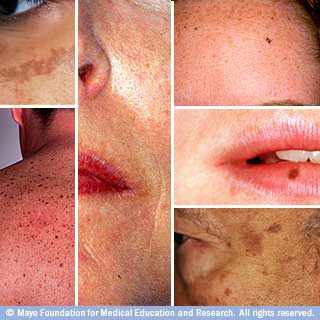 Any type of sun exposure can lead to skin cancer and other types of skin damage. Whether you’re trying to avoid early wrinkling, age spots, keratoses, skin cancer, or more, protection from the sun is key at this point. Anybody who has applied sunblock or sunscreen knows that they only work for a certain period of time. Having to reapply sunblock throughout the day can be a huge pain and get in the way of enjoying yourself. Hats don’t always work either, since they only cover part of the face. So what can you do if you want to enjoy yourself in your backyard without worrying about your skin getting damaged? Archadeck has a number of appealing options that can protect you from the sun and make your outdoor living space welcoming and comfortable as well. 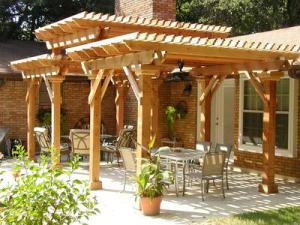 Between open porches, patios, gazebos, and pergolas, your choices are endless.